Spirit of Revolt continues its outreach program with another Show and Tell event, again in conjunction with The Mitchell Library. Once more Spirit of Revolt brings the archive to the people and the people to their history. 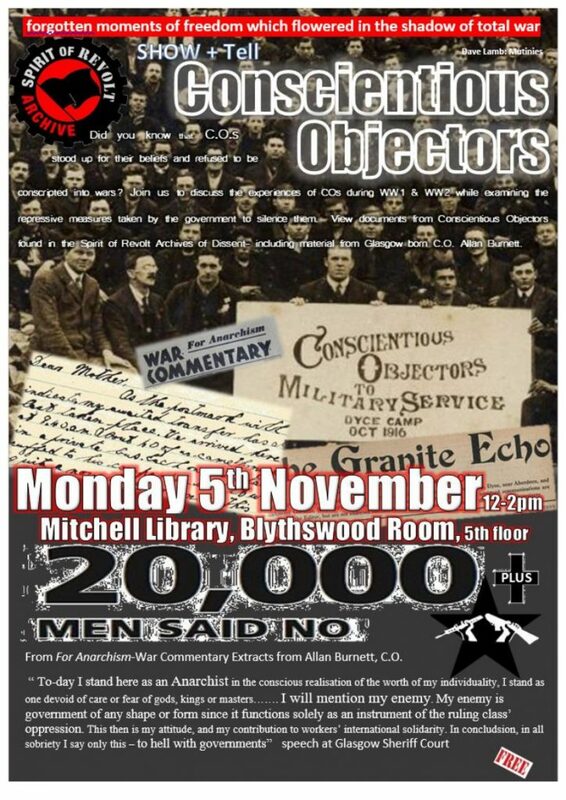 This event is on Conscientious Objectors from WW1 and WW2. It will take the form of an open discussion, being introduced by SoR group member, Eric Chester, on display will be material on Conscientious Objectors select from archive by our archivist Paula. Subject, Conscientious Objectors, WW1, WW2. This entry was posted in John Cooper Collection, News, Uncategorized. Bookmark the permalink. Both comments and trackbacks are currently closed.